1. Pick out which pieces you want to put together and test it out. They should be able to balance on each other without the glue. If not, you may want to rethink your choices..is your plate too uneven or does your base have a flat enough top? 2. 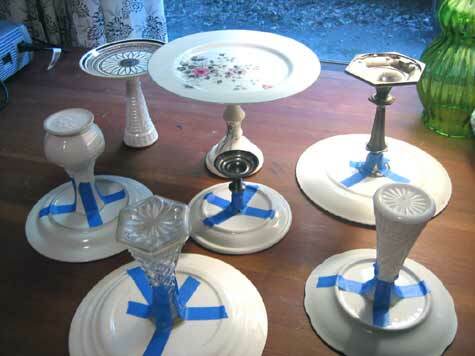 Clean all plates and vases/candlesticks thoroughly. Dry completely. 3. Measure the back of the plate and mark a dot in the center with a pen or marker. 4. Squeeze out a little epoxy and follow its directions for use. After it’s mixed, apply it to the top of the candlestick/vase and gently place your base upside down onto the plate, using your dot as a guide to help you center it. 5. Let it sit for a few minutes, then gently press down on it to hold it in place and get rid of any excess epoxy with a q-tip. Apple tape on four sides to anchor it while it dries. Note: While these are sturdier than you would expect, they are not dishwasher safe. I recommend gently cleaning by hand. After the cakestand is glued together and dried overnight, you can pretty much do whatever you want with it: paint, decoupage, etc. I really love Sarah Cihat’s graphic patterns so I decided to do something similar on one of my less attractive plate/vase combos. 1. Trace and cut out your pattern on contact paper. Make sure contact paper still has its paper backing on it when you do this. 2. Gently peel contact paper away from its backing and place the sticky side on your plate where you want the design to go. Press down evenly and smooth out any and all air bubbles. Make sure all edges are firmly pressed down. 3. Prime the entire plate and base with primer spray paint and let dry (you will need to flip it over a couple times, make sure the top is dry before you flip it to spray the bottom). 4. Paint it whatever color you wish. Let dry completely. 5. When dry, use an exacto to carefully lift the contact paper. Note: This plate is not meant to have your bare food placed on it. Usually I place cupcakes or pies in their pans on cakestands. If you want to be able to put food directly on it, I recommend sealing it with a varnish or sealant. 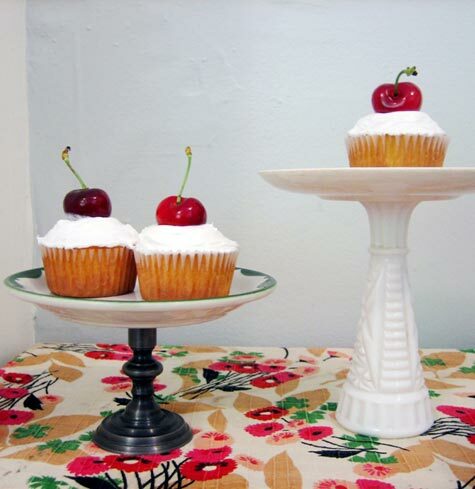 *if you’d prefer to buy rather than craft, you can pick up these exact cake stands from kate at her etsy shop ! Simply brilliant! Nice work, Kate! And I’m a huge Sarah Cihat fan. I’m addicted! I already have 50,000 of these made in my head, what a greaat idea….I cna’t wait to make some and give as gifts! I’m ALWAYS looking for a great (and unique) cake stand! This is so great. I’m only sad I did not think of this on my own! Again, thanks for inspiring! My only qualm, however, is that the tops are supposed to be flat, which might cause some trouble if you were using this piece for delicate cakes and not small, yummy [more durable] treats, as pictured. Still, a great use of discarded/mismatched pieces. Kate, what kind of paint did you use — Spray paint or acrylic craft paint? Thanks! i bet these would make really lovely centerpieces for a garden party or DIY-themed wedding, too – you could add patterns at the edges and then group a few votive candles (or make a small flower arrangement) in the center. i wish i’d thought to do that for MY wedding, actually! (Top Photo) What a fabulous image! what a great idea! I see tons of those white “cut” glass vases at the thrift store…what idea for a party…make up a bunch of these! wow.. this is pretty effing cool. Thanks! InspireMe – I used regular acrylic spray paint, but I think you could use any kind. I do suggest finishing it with a varnish or clear sealant, maybe something from Michaels…hope this helps!! Wow. As a collector of beautiful cake stands, I am madly in love with this project! this is a great i have so many ideas and want to send this to everyone i know, but at the same time i want to keep it all to myself so we they see my attempts they’ll be amazed!!! Do you have any ideas on how to add come sort of lid or covering to it? Fabulous project! I can’t wait to make one of my own. Is the paint you used food safe and will I be able to wash the stand in hot water or will it peel off? This is a great idea……you might have inspired some new and improved cupcake stands. I actually worked with sarah way back when at SPRING gallery; I’ve always loved her stuff. wow these really excite me! What are the flowers? They are so pretty. wow! I’ve been looking for recykled cakestands and now I can make it myself. Thank You! 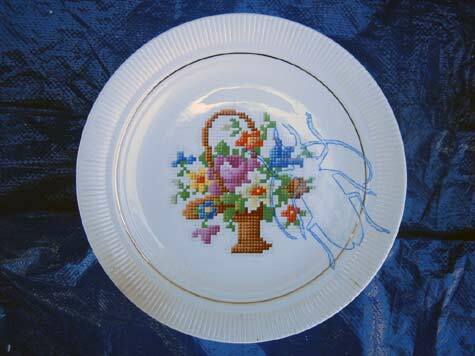 Hey – I had plates just like the brown one with the flower in the middle – it brought back memories. Brilliant! 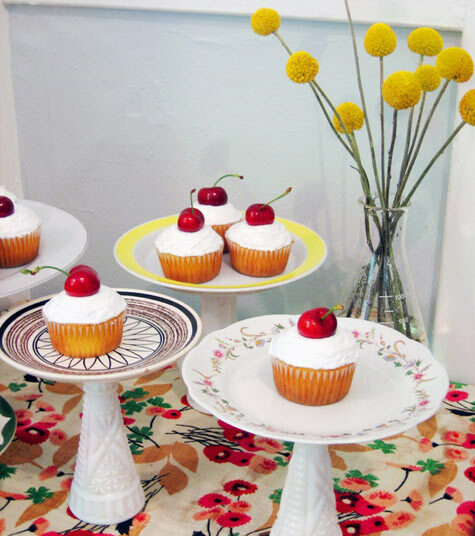 I’ve been looking for unique cake stands with a vintage flavor, but to no avail… until now! Thanks for sharing your wonderfully creative idea! I’m so glad you posted a tutorial!! i’d seen this long, long ago and forgot how they made them stick! Thanks for the cr8tv idea! Fun idea. Wouldn’t it be easier to decorate the plates, or at least to adhere the contact paper for the silhoutte, before you attach them to the bases? I’d have identified those flowers as button chrysanthemums, but I haven’t found a good picture. apple tape – wassat? Is it what i call electric tape? I love new names for things. This is way cool, already impressed a bunch of people with my 1st piece at a birthday party. Thanks for sharing! I can’t believe I never thought of this. I have SO MANY vases and I love, no ADORE plates. And cakestands, well what can I say. I have four of them and I need more……what a lovely idea and great way to recyle. Can’t wait to go off to the thrift store to buy plates. I just finished making one of these for my sister! I LOVE IT! Thanks so much for the amazingly creative idea, you are great! I don’t know, but I love you! You’re the greatest! Here I was contemplating how much its gonna cost me to get a cake stand (prices out here are ridiculous, plus I’d have to settle for something i didn’t really like). Now thanks to you I can make my own, spend less and I WILL LOVE IT…when I photograph my cake on the stand I’ll post a link on my blog to this page if thats ok with you. I have made a few of these with brass candlesticks and plates. I just LOVE this idea for holding special desserts and cupcakes! I have not painted mine, but what a great idea! I also did some using wood candleholders and wooden plates I had. I am addicted to making my own stands. I used ‘covers’ from the thrift store like for cheese plates and small cloches. I am off to Goodwill now….I must make some of these. They are fantastic! OH! you are a lifesaver. I am having six cakes from a favorite restaurant rather than a single wedding cake, and will need cake stands of varying tiers… now I can make my own!!! THANK YOU! Great for bridal shower gifts. Very creative! So unique and beautiful! I love it! i did this for our wedding a fewweeks ago and i spray painted half of them red and half light blue. I used ugly plates that could fit 8 inch cakes and had varying heights (different candle sticks and vases) with the tallest one as the focal point with a ceramic cake topper from etsy. everyone LOVED them and some people took one home as a keepsake. :o) i was very happy with the price and the outcome – $25 for plates, glue, and spray paint. and the cake was fantastic and still cost cost about $100 less than if I had gone with a ‘wedding’ cake! Thanks so much for this idea, made a beautiful set for my friend’s wedding. I looooove this kind of upcycling!!! These are all so beautiful. Sooo….all you clever kitties that have done this with paint, what am I looking for on my spraypaint level to ensure the type I buy won’t run everywhere, and will instead give a nice finish? I’ve tried spraypainting a few shiny, smooth things (like tins), and I’m just left with streaks. I welcome tips; welcome them! I love all of these. Will def be making some xmas ones for entertaining and gift giving. This is such a great idea, it’s unique and crafty. I just might use this idea at my wedding! I used glass glue and the inside of the glass under the plate made a gas or something and it turned white. What did i do wrong? I simply love this! What a brilliant idea. I do wish I saw this earlier. I just redid my kitchen and adjoining room and got rid of two china cabinets and chucked all my bud vases and candlesticks. 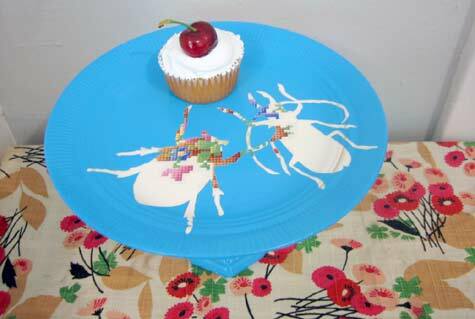 I am sure I will find more…..a girl just cannot have enough cake plates! so creative I must say. I’ve seen this idea before, but your execution looks sublime! wow. Wow. This is definitely on my list of To Dos! Amazing and very unique! I love this idea. Thanks for the tutorial. Just wondered if these are “tippy”…especially when cutting the cake? I love the idea though…any feedback? We’ve made these for center pieces for weddings. Secure floral foam to the center and design away. The last one we did, the Bride found the plates, we secured vintage candlesticks, then the flowers and they gave them away at the end of the wedding.